Have you ever wanted to take your dog to a street fair, Saturday market, parade, or a pet expo but haven’t because you are afraid of controlling your dog in large crowds? Or, have you taken your dog to one of these events and then had to leave because you just weren’t able to control your dog? Don’t worry, you are not alone. Handling a dog in a crowd can be a difficult and stressful situation. There are a lot of dangers within the crowd itself — people stepping on your dog, tripping on them, other dogs that may or may not be friendly, children running up and grabbing your dog from behind or by the ears — not to mention your dog’s reactions to all of the sights, smells and other stimuli going on around him. The following simple tips should relieve the stress and help you control your dog in a crowd. 1. Start early. If you have a puppy, there is no time like the present to get him used to be being in crowds. Expose him to as many sights, smells, sounds, dogs, and people as you can. The more you desensitize him when he is young, the easier it will be to control him in a crowd when he gets older. 2. Know your dog’s limits. Whether your dog is old or young, chances are there is something she is fearful of or doesn’t like. At home, with the help of friends and their kids and dogs, see what situations make your dog uncomfortable. It’s better to find out at home with friends that your dog might snap when touched from behind, for example, than for her to snap at a stranger on the street who might demand she be put down. Once you know what her buttons are, you can work with a trainer on overcoming those and, in the meantime, you know what to avoid when you are in a crowd. 3. Avoid over-stimulation. 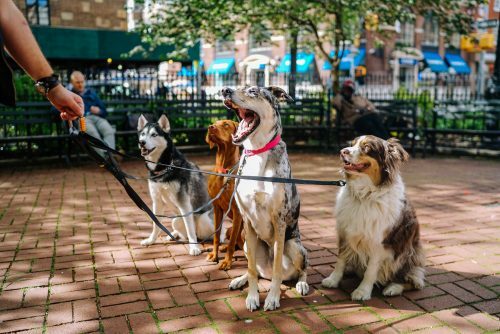 If your dog is not used to big crowds, start out by going to smaller events with less excitement and fewer distractions, so that each experience is a positive one. One bad experience, and your dog could develop a fear of crowds. 4. Keep your dog close. The worst thing you can possible do is have your dog on a flex lead in a large crowd. (In fact, Cesar discourages the use of any kind of flex lead except specifically during tracker training. If you don’t know what that is, then you should never use a flex lead.) The closer your dog is to you, the more control you have over him and whatever is around him. It’s not just for your dog’s safety — a leash is a big tripping hazard for anyone else walking through the crowd, and flex leads are hard to see, even from fairly nearby. 5. Heel. Nothing is better than the heel command. A dog that has a rock solid heel will be the easiest dog to control in a crowd because she is right by your side at all times. Start off with short walks and gradually build up distance as your dog learns the command. 6. Teach focus. Before stepping into any type of crowd situation, your dog should have a command word that means to focus on you. A common one is “watch me,” where the dog is taught to look at you when you say it. This is a great command for regaining your dog’s focus in distracting situations. Be sure to build the command up with slowly increasing distractions and stimulation to ensure success. 7. Be aware. One of the most important things about controlling your dog in a crowd is not about the dog at all. It’s about you projecting calm, assertive energy, then being a diligent owner by watching your dog and what is going on around him. We have all seen the owner who is busy talking to someone while their dog, usually on a long leash, is six feet away, pestering a person, getting into a fight with another dog, or eating something that might be dangerous. This is the type of situation that is easily avoided by keeping your eyes on your dog while you talk to other people. If they think you are being rude, just explain to them the reason. They should commend you for being a good dog owner. 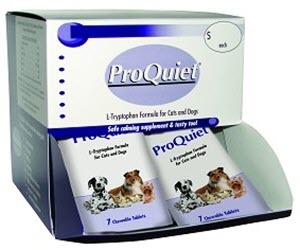 See your vet for options treating dog and cat anxieties – they can recommend options like ProQuiet. ProQuiet® is based on an essential amino acid and B vitamins to support nervous system health. Each ingredient plays a role in supporting a healthy nervous system. -Highly palatable, chewable tablet for cats and dogs. Main ingredients: L-Tryptophan (120 mg), Taurine, Vitamin B3, Vitamin B6, Hops (75 mg), Chamomile(75 mg), Ginger Root (5 mg), Brewer’s Yeast, Liver Flavor. Talk to us about how this can help your dog or cat anxieties.